LS: Loamy Sand; SL: Sandy Loam; L: Loam; Sil: Silt. The changes in climate parameters are being felt globally in the form of changes in temperature and rainfall pattern. The global atmospheric concentration of carbon dioxide, a greenhouse gas (GHG) largely responsible for global warming, has increased from a pre-industrial value of about 280 ppm to 387 ppm in 2010. It is certain that global mean surface temperature (GMST) has increased since the late 19th century. Each of the past three decades has been successively warmer at the Earth’s surface than any the previous decades in the instrumental record, and the decade of the 2000’s has been the warmest. The globally averaged combined land and ocean temperature data as calculated by a linear trend, show a warming of 0.85 (0.65 to 1.06°C), over the period 1880–2012, when multiple independently produced datasets exist, about 0.89 (0.69 to 1.08°C) over the period 1901– 2012, and about 0.72 (0.49 to 0.89°C) over the period 1951–2012 when based on three independently-produced data sets. The total increase between the average of the 1850–1900 period and the 2003–2012 period is 0.78 (0.72 to 0.85°C), based on the Hadley Centre/Climatic Research Unit gridded surface temperature data set 4 (HadCRUT4), the global mean surface temperature dataset with the longest record of the three independently-produced data sets . The global average sea level rose at an average rate of 0.19 mm (0.17- 0.21) per year over 1901 to 2010 . There is also a global trend of an increased frequency of droughts as well as heavy precipitation events over many regions. The IPCC (2007) projected that temperature increase by the end of this century is expected to be in the range 1.8 to 4.0°C. For Indian region, projected mean warming ranging from of 2°C (RCP 2.6) to 4.8°C (RCP 8.5) from 1880s to 2080s through CPIMP5 model ensemble based projections. All India Precipitation( Pcp) is projected to increase by 6%, 10%, 9% and 14% under the scenarios RCP2.6, RCP4.5, RCP6.0 and RCP8.5 respectively, by 2080s relative to the 1961–1990 baseline, whereas much larger variability will be seen in the spatial distribution of Pcp. Climate change may affect agriculture and food security by altering the spatial and temporal distribution of rainfall, and the availability of water, land, capital, biodiversity and terrestrial resources and these effects at regional scale are not fully understandable. It is the integrated effect of all climate parameters such as temperature, CO2, rainfall, solar radiation, relative humidity, etc. that determine the crop water requirements and yield. Under climate change scenario daily weather data is generally derived from general circulation models (GCM) and/or regional climate models (RCM). In recent years, usage of RCM has increased to generate the scenarios at higher resolution over a limited area of the globe. The RCM is able to resolve features on finer scales than those resolved by the GCM, particularly those related to improved resolution of the topography . Zacharias used the climatic outputs of an RCM–PRECIS (providing regional climates for impact studies) model to analyze baseline simulation daily weather data on temperature and precipitation patterns with the observed weather for the corresponding period (1960–1990) in order to find out the bias in the model . But the raw outputs of GCM/RCM often suffer from systematic errors which may prevent them from being applied directly for analysis of behavior of the climate system, its eventual changes and their local impacts on crop development, growth and yield. To study the impact of changing climate, numbers of crop models are available in the literature but the models like Decision Support System for Agro Technology Transfer (DSSAT), InfoCrop and cropping system simulation (CropSyst) are widely used because these models assess the effects of CO2 and weather parameters on crop growth, biomass, water balance, nitrogen balance on daily basis. The DSSAT Crop model has an edge over the previous controlled FACE, OTC, TGT experiments and simulation [5-14], in which the daily change created in weather parameter was constant throughout the growth period of the crop. Thus, keeping this in view, the present study was undertaken with the objectives to (i) obtain climate data on maximum temperature (Tmax), minimum temperature (Tmin) and rainfall (RF) for baseline and future from HAD GEM2-ES GCM model under RCP 4.5 and RCP 8.5, and this data so obtained were corrected for biases using linear scaling method (ii) assess the effect of climate change scenario on water requirements, productivity and water use efficiency of rice–wheat system in climatic conditions of Punjab, India. The study was carried out for climate data of Ludhiana (75°52′ E longitude and 30°56′ N latitude) in the Punjab state (73°53′to 76°55′ E longitude and 29°33′ to 32° 31′ N latitude) of India. The climate of the area is semiarid. Past 46 years (1970– 2015) daily weather data on RF, Tmax and Tmin recorded at meteorological observatory were used in this study. Climate change RCP 8.5 scenario data for Tmax, Tmin and RF was derived from HAD GEM2-ES-General circulation model on daily basis for Ludhiana for time period of 1970–2015 (baseline), 2020–2050 (mid-century) and 2060–2090(end-century). Biases in Tmax, Tmin and RF data were evaluated for monthly trends and statistical parameters like mean (μ), standard deviation (σ) and variance (σ2). The biases were minimized by applying correction functions developed from observed and modeled data of years from 2010 to 2015, as it was producing the least error between the observed and modelled data after the application of correction functions and validated on the data for randomly selected two years. Linear scaling method for development of correction functions at monthly scale was used (Figures 1 and 2). Monthly averages of 6 years (2010-2015) of the observed and GCM-HAD GEM2 ES modelled maximum temperature (Tmax) and minimum temperature (Tmin) for the location showed that the modelled temperature approximately represented the observed seasonal cycle. However, the modelled values of Tmax were higher than that of the observed in the months of May, June, August, September, October and December. 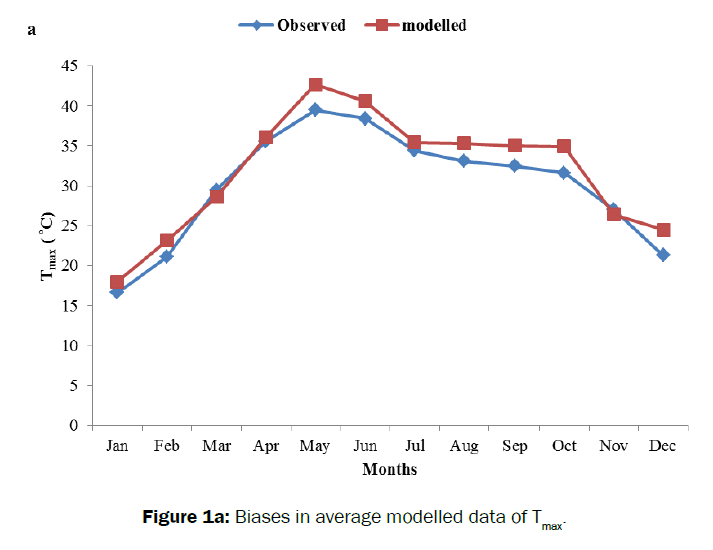 Modelled Tmin also followed the trend similar to that of Tmax but the modelled values were higher for the months of May and June and less for the month of November. The biases for the Tmax and Tmin are showed in (Figure 1a and b). 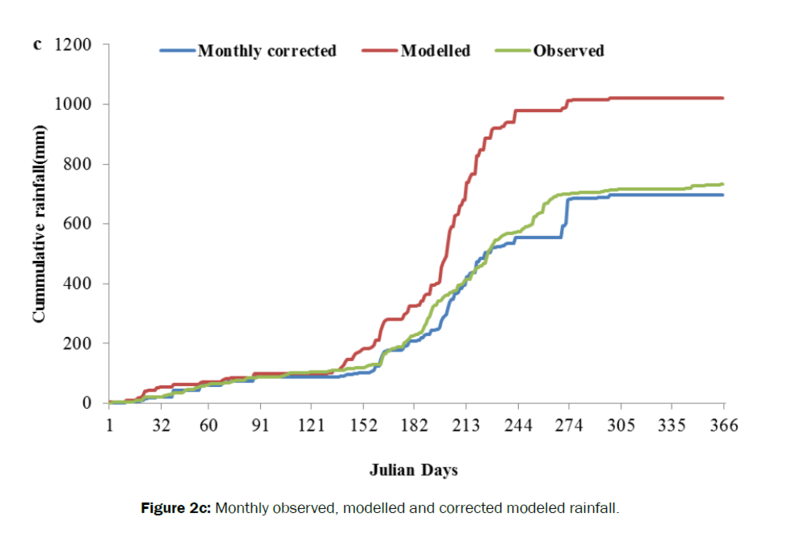 In case of rainfall, the modelled rainfall was less during the months of February, September and October. Zero rainfall was predicted by the model for the months of April, November and December where as the model predicted higher rainfall than observed in the remaining months of January, March, May, June, July and August. The biases in the rainfall data is shown in (Figure 1c). The analysis of the statistical parameters i.e., annual mean (μ), standard deviation(σ) and variance (σ2) of Tmax showed that the μ of the modelled Tmax was 1.6°C more than that of the observed while as σ of modelled Tmax was 0.8°C less than that of observed Tmax data. In Tmin μ’s of modelled and observed were comparable but σ was 1.3°C more in the modelled data than observed Tmin. In case of rainfall, μ of the modelled rainfall was 0.78 mm day-1 more than that of the observed and σ for the same was 1.67 mmday-1 less than observed (Table 1). Figure 1a: Biases in average modelled data of Tmax. 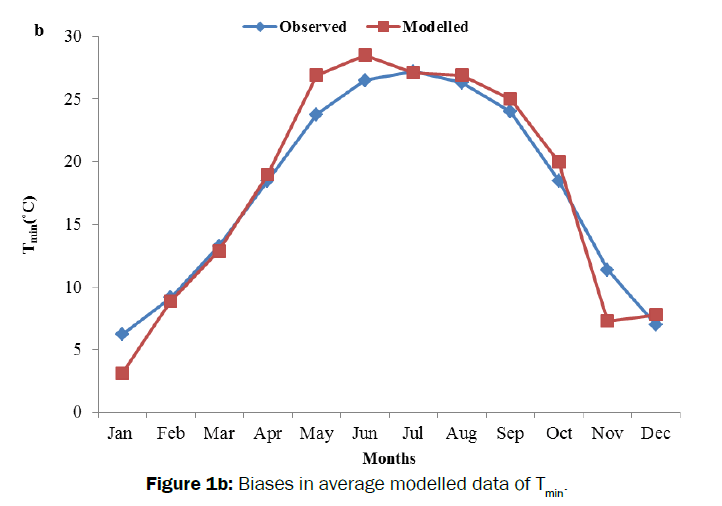 Figure 1b: Biases in average modelled data of Tmin. 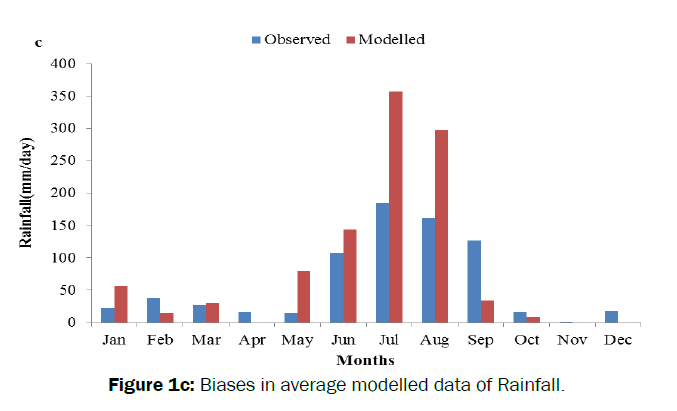 Figure 1c: Biases in average modelled data of Rainfall. Table 1. Statistical parameters of modelled and observed temperatures and rainfall. 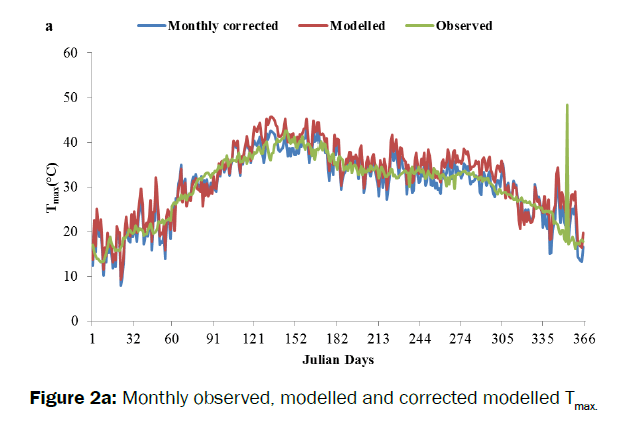 The results given in (Figure 1) and (Table 2) showed that discrepancy occur in climate model simulations and observations. Therefore, it was necessary to adjust (calibrate) the variables to correct the climate model biases. In climate change studies, mostly two correction methods viz. bias correction and change factor documented in the literature are used . The change factor method was applied in another independent study and discussed elsewhere . In the present study linear scaling approach was used to correct the bias. The corrected modeled data of Tmax (Figure 2a) and Tmin (Figure 2b) were found closer to the observed with respect to time trends and magnitude. Time trends of RF showed that the modeled cumulative rainfall (CRF) was lower than the observed with almost matching in the beginning of the year, decreasing in the middle and then again coming close till the end of the year (Figure 2c). Annual modeled CRF was 160 mm more than that of the observed. With correction, it is not only that the time trends became similar to that of the observed but also the difference in corrected modeled and observed, CRF was reduced to 20 mm only. Root mean square error (RMSE) of corrected modeled Tmax and Tmin was 5% each, respectively, which fall in excellent to good category . However, RMSE of model corrected RF remained high (15%) even after correction. Figure 2a: Monthly observed, modelled and corrected modelled Tmax. 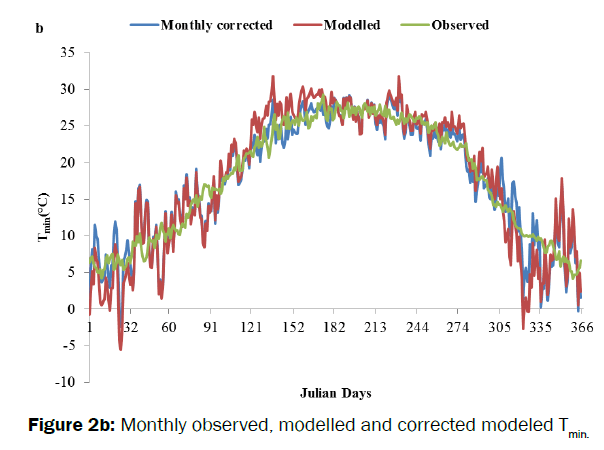 Figure 2b: Monthly observed, modelled and corrected modeled Tmin. Figure 2c: Monthly observed, modelled and corrected modeled rainfall. Table 2. Water balance components and- use efficiency of rice and wheat crops as influenced by different time slices of the 21st century and soil texture under RCP 8.5. In the baseline the average ± standard deviation of RF was 759.79 ± 227.1 mm. which is likely to increase to 912.48 ± 146.45 mm in MC and 1010.95 ± 65.06 mm in EC under RCP 8.5. In case of Tmax, under RCP 8.5, average annual Tmax of 29.70 ± 0.5°C for the baseline would increase to 33.14 ± 0.45°C in MC and 35.87± 0.7°C in EC. Correspondingly, average annual Tmin of 16.64 ±0.8°C of baseline would increase to 18.73 ± 0.5°C in MC and 21.41 ± 0.6°C in EC under RCP 8.5. This indicated that mean annual temperature would increase by 2.75°C in MC and 5.46°C in EC compared to that of the baseline period under RCP 8.5, respectively. The corresponding increase in annual RF under RCP 8.5 is 153 mm and 251 mm, respectively. Simulated crop yields and water balance components of rice and wheat crops in the Baseline, MC and EC for four soil series are presented in (Table 2). In baseline the resultant simulated yield, averaged across soils and years was 6419 kg ha−1 in rice and 5771 kg ha−1 in wheat and was closer to the observed under field conditions [23-25]. Under RCP 8.5 averaged across soil series, yield of rice in MC would be increased by 1.09 t/ha (17.13%) and in EC yield was reduced by 855.5 kg/ha (13.32%), respectively from the baseline . Yield of wheat in MC and EC would be reduced by 1.6 t/ha (29.6%) and 2.6 t//ha (46.4%), respectively from 5771 kg/ha in the baseline. Reduction in yields of rice and wheat crops in different time slices was found to be directly related to increased Tmax and Tmin. Effectively increased temperature has shortened the crop duration in addition to increased respiration, less assimilation per unit water consumed, decreased nutrient absorption, low dry mass production, high spikelet sterility and sink capacity at grain filling, reduced grain weight, etc. [27-33]. The resultant crop duration, under RCP 8.5, in MC and EC (averaged over soil series), would be shortened by 5 days and 4 days in rice and 6 days and 11 days in wheat, respectively (Figure 3). The effect of climate change on rice and wheat yield varied with surface soil texture of the soil series and time slice of the century (Table 2). Under RCP 8.5, in MC, rice yield increased by 1331 kg ha−1 in loamy sand, 507 kg ha−1 in sandy loam, 1210 kg ha−1 in loam and 1457 kg ha−1 in silt loam soils. In corresponding soils, rice yield in the EC was decreased by 621 kg ha−1, 1293 kg ha−1, 819 kg ha−1 and 635 kg ha−1 for silty loam, respectively. In MC wheat yield was decreased by 2124 kg ha−1 in loamy sand, 1289 kg ha−1 in sandy loam, 1776 kg ha−1 in loam and 1924 kg ha−1 in silt loam soil. In corresponding soils, wheat yield in the EC was decreased by 3225, 2360, 2564 and 3062 kg ha−1, respectively (Table 2). These results indicate that impact of climate change is modified with soil texture owing to differential irrigation water. Rice yield in MC and EC decreased almost in all the years compared to that of the baseline. Yield of wheat decreased in lesser number of years in both MC and EC. Though wheat yield decreased in less number of years but the magnitude of decrease was more than rice especially in EC. For example, the lowest simulated yield in wheat was 4885 kg ha−1 in year of 2090 and in rice it was 5741 kg ha−1 in year 2032. These results bring out that inter year rotation information on crop yields in MC and EC can only be obtained using HAD GEM2-ES and like models, which provide daily weather data. 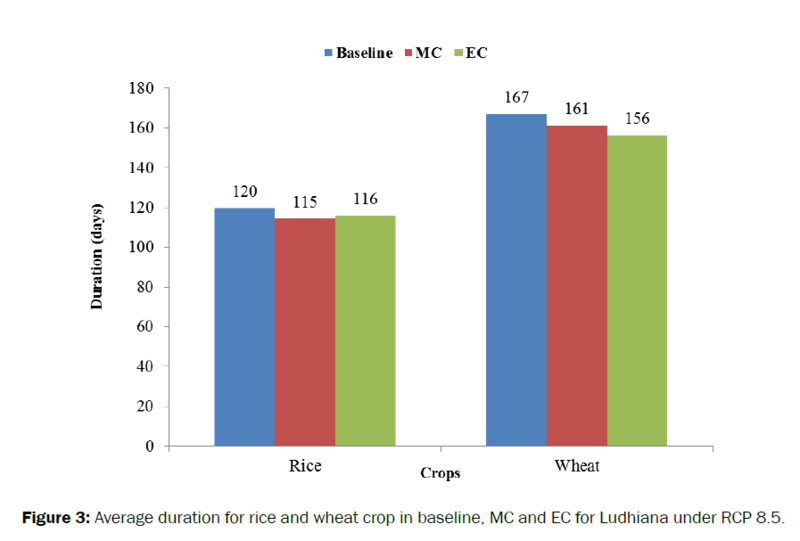 Figure 3: Average duration for rice and wheat crop in baseline, MC and EC for Ludhiana under RCP 8.5. Under RCP 8.5 the irrigation demand was decreasing in all the three time periods due to more rainfall in these periods while in wheat crop less rainfall in these periods has led to increase in demand of irrigation. It was computed for Ludhiana district for rice crop that the annual water requirement would reduce to 1289.6 mm (13.7%) in MC and 1305 mm (12.7%) in EC from the 1494.9 mm in the baseline. In wheat crop the annual irrigation water requirements would increase to 390.2 mm (27.1%) in MC and 401.1 mm (30.6%) in EC from the irrigation requirement of 306.9 mm in the baseline. Under RCP 8.5, in MC, the RF was increased by 149 mm during rice and decreased by 78 mm during wheat crops. The corresponding values in EC were 234 mm and 93 mm, respectively. As a consequence of fluctuating behavior of rainfall, under these two scenarios the irrigation requirement (averaged over soils) in MC and EC was decreased by 128 and 110 mm in rice; and increased by 73 and 129 mm in wheat, respectively. In RCP 8.5, in MC and EC irrigation was decreased by 205 and 190 mm in rice; and increased by 83 and 94 mm in wheat, respectively. Under RCP 8.5, in MC and EC, ET was increased by 187 and 252 mm in rice; and decreased by 25 and 22 mm in wheat, respectively under elevated temperature, decrease in ET due to shortening of crop duration has also been reported . Under RCP 8.5 decrease in drainage components for MC and EC was computed as 146 and 177 mm for rice crop and zero drainage was computed for wheat crop. Water use efficiency, under RCP 8.5 in rice was decreased from 1.16 ± 0.05 kg m−3 to 1.01 kg m−3 in MC and 0.69 kg m−3 in EC. However in wheat crop water use efficiency decreased from 1.24 ± 0.27 kg m−3 to 0.92 kg m−3 in MC and 0.70 kg m−3 in EC. 1. Bias corrected HADGEM2-ES Global climate model simulations predicted that in central Indian Punjab temperature will increase by 1.56°C in mid and by 3.11°C in end of the 21st century, will increase by 2.75 °C and by 5.46°C, respectively under RCP 8.5. 2. The increased temperature would decrease the demand for irrigation in rice crop however an increase in demand of irrigation for wheat crop was predicted by the model, which may be due different rainfall magnitudes during the growing periods of these two crops. 3. The increased temperature reduced yields of rice and wheat crops by shortening their duration. With changed climate not only the irrigation requirements, crop yields would reduce but evapotranspiration and water use efficiency would also decrease. Stocker TF. Technical summary. In Climate change 2013: the physical science basis. Contribution of Working Group I to the Fifth Assessment Report of the Intergovernmental Panel on Climate Change. Cambridge University Press. 2013;33-115. IPCC. 2014 Summary for Policymakers. In: Climate Change 2014: The Physical Science Basis. Contribution of Working Group III to the Fifth Assessment Report of the Intergovernmental Panel on Climate Change. Kumar KR. High-resolution climate change scenarios for India for the 21st century. Curr sci. 2006;90:334-345. Zacharias M, et al. Evaluation of a regional climate model for impact assessment of climate change on crop productivity in the tropics. Curr Sci. 2015;108:1119. Baker JT, et al. Temperature effects on rice at elevated CO2 concentrations. J Exp Bot. 1992;43:959-964. Batts GR, et al. Effects of CO2 and temperature on crop growth and yield of wheat over four seasons. Eur J Agron. 1997;7:43-52. Bender J, Herstein U, Black CR. Growth and yield of spring wheat to increasing CO2, ozone and physiological stresses: a statistical analysis ESPACE-wheat results. Eur J Agron. 1999;10:185-195. Dhakhwa GB, et al. Maize growth: assessing the effects of global warming and CO2 fertilization with crop models. Agric For Meteorol. 1997;87:253-272. Jalota SK, et al. Effect of elevated CO2 and temperature on productivity of three main cropping systems in Punjab state of India: a simulation analysis. In: Panigrahy, S., Ray, S.S., Parihar, S.S. (Eds. ), ISPRS Archives XXXVIII-8/W3 Workshop Proceedings: Impact of Climate Change on Agriculture. ISPRS WG VIII/6 Agriculture, Ecosystem and Bio-diversity SAC (ISRO), Ahmedabad. 2009b;138-142. Kaur H, et al. Climate change impacts on yield, evapotranspiration and nitrogen uptake in irrigated maize (Zea Mays)–wheat (Triticum aestivum) cropping system: a simulation analysis. Indian Journal of Agricultural Research. 2012;82:213-219. Kimball BA, et al. Response of agricultural crops to free CO2 enrichment. Advances in Agronomy. 2002;77:293-368. Lal M, et al. Vulnerability of rice and wheat yields in the NW India to future changes in climate. Agricultural and Forest Meteorologyis. 1998; 89:101-114. Mitchell RAC, et al. Effects of increased CO2 concentration and temperature on growth and yield of winter wheat at two levels of nitrogen application. Plant Cell Environ. 1993;16:521-529. Schutz M and Fangmeier A. Growth and yield response of spring wheat (Triticum aestivum L. cv Minaret) to elevated CO2 and water limitations. Environ Pollut. 2001;118:187-194. Jones JW, et al. DSSAT Cropping System Model. Eur J Agron. 2003;18:235-265. Hoogenboom G, et al. Decision Support System for Agro technology Transfer (DSSAT) Version 4.6 (http://dssat.net). DSSAT Foundation, Prosser, Washington. 2015. Jalota SK, et al. Performance of Cropsyst model in rice–wheat cropping system. J Agri Phy. 2006; 6:7-13. Jalota SK, et al. Water and nitrogen balance, -use efficiency in rice (Oryza sativa L.)–wheat (Triticum aestivum L.) cropping system as influenced by management interventions: Field and simulation study. Experimental Agriculture. 2011;47:609-628. Kaur S. Modeling the impact of climate change on groundwater resources in central Punjab. Ph.D. dissertation. Punjab Agricultural University, Ludhiana, India. 2013. Jalota SK, et al. Mitigating future climate change effects by shifting planting dates of crops in rice–wheat cropping system. Reg Environ Change. 2012;12:913-922. Chun KH, et al. Calibration strategies: a source of additional uncertainty in climate change projection. Bull Am Meteorol Soc. 2012;93:21-26. Jamieson PD, Porter JR, Wilson DR. A test of computer simulation model ARC wheat on wheat crops grown in New Zealand. Field Crops Research. 1991;27:337-350. Chahal GBS, et al. Yield evaporation and water productivity of rice (Oryza sativa L.)–wheat (Triticum aestivum L.) system in Punjab (India) as influenced by transplanting date of rice and weather parameters. Agric Water Manag. 2007;88:14-22. Jalota SK, et al. Integrated effect of transplanting date, cultivar and irrigation on yield, water saving and water productivity of rice (Oryza sativa L.) in Indian Punjab: field and simulation study. Agricultural Water Management. 2009a;96:1096-1104. Mahajan G, et al. Yield and water productivity of rice as affected by timing of transplanting in Punjab, India. Agric Water Manag. 2009;96:5250-5254. Chun JA, et al. Assessing rice productivity and adaptation strategies for Southeast Asia under climate change through multi-scale crop modeling. Agric Syst. 2015:143:14-21. Kobata T, et al. Rate of development of post-anthesis water deficits and grain filling of spring wheat. Crop Sci. 1992;32:1238-1242. Kobata T and Uemuki N. High temperatures during the grain filling period do not reduce the potential grain dry matter increase of rice. Agron J. 2004;96:406-414. Mackill DJ, et al. Pollen shedding and combining ability for high temperature tolerance in rice. Crop Science. 1987;20:730-733. Matasubayashi M. Theory and Practices of Growing Rice. Fuji Publishing Company, Tokyo. 1965. Saini AD, et al. Influence of sowing dates on pre-anthesis phenology in wheat. Indian J Agri Sci. 1986;56:503-511. Satake T and Yoshida S. High temperature induced sterility in Indica rice at flowering. Japanese J Crop Sci. 1978;47:6-10. Yoshida N. Photosynthesis and dry matter production in rice plant. In: Symposium on Rice Problems. Pacific Science Congress. 1961. Buttar GS, et al. Yield and water productivity of Bt cotton (Gossupium hirsutum) as influenced by temperature under semi-arid conditions of north-western India: field and simulation study. Indian J Agr Sci. 2012;82:44-49.